Beaumarchais translates to Beautiful walking. (maybe not so beautiful on a saturday on a lovely Autumn day in Paris). I saw this at a stall, the guy had a series of them. This one is of some police checking out a car accident. the car has gone over an embankment. I was wondering where someone would hang a painting like this. The loo? The garage? or perhaps above a bar? I had the one with not much cream, as cream keeps me up at night feeling a little ill.
Eric’s way of saying please was “s’il vous please” which was tres cute. 😀 There were people from Argentina, Texas USA, Canberra, UK and a couple from Norway in France to get married at the Norwegian Embassy the next day. We tried to invite ourselves but they changed the subject HA. Eric also was courteous enough to ask us all if we knew how to get back to our lodgings. This stood out to me as very nice as I had a bit of a bad experience after the champagne tour at the start of my holiday. I did not want to tell it at the time so as not to freak out family members. The champagne tour was meant to be pick up from door get dropped back at door. My street is one way and pokey. I offered to be dropped at the bottom/top of my street. Instead he dropped me at Hotel De Ville and said walk 200 metres and then turn right. I had been tasting wine since 10.30 in the morning, been in Paris for less than 48 hours and carrying two bottles of champagne and a flute ( in a box). I managed to get find my way home but it is not 200 metres from Hotel de Ville and it was not a nice experience. Last night I went to a restaurant in Le Marais called Auberge Nicolas Flamel and had their 5 course degustation with accompanied wines. It was very enjoyable and really quite reasonably priced. 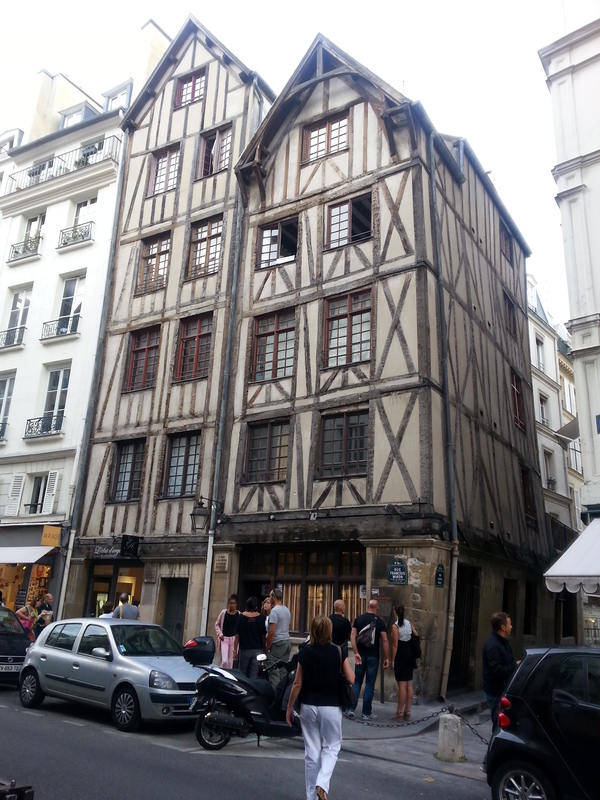 The restaurant is in one of the oldest “houses” remaining in Paris. It is named after one of it’s long gone owners named Nicolas Flamel. I didn’t take photos of the courses as I was “worried” that it would upset them. There must be all sorts of places to dispose of touristes intolérables in a 600 plus year old house. The second was Foie Gras topped with strawberry gelatine with toast. ( just normal wholemeal bread- no crusts). 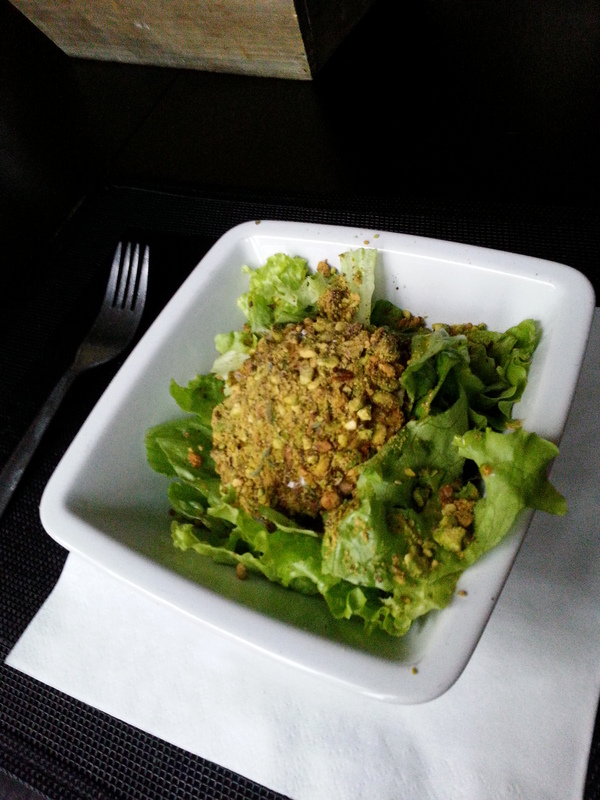 It was the first time I had Foie Gras and it was very different to what I had expected. It was so smooth and delicious . I had read good things about this restaurants Foie Gras and was very keen to try it. Third course was scallops topped with salmon roe accompanied by a tiny bit of cauliflower cooked in tempura and a creme with basil. This was scrumptious. 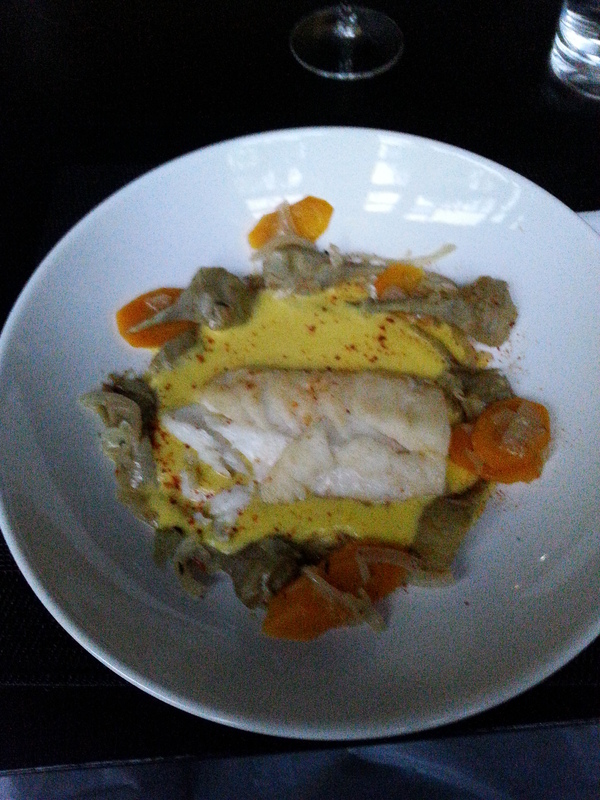 Fourth course was a piece of Turbot on top of some butternut mash and a squash creme. I am not a big fan of fish. This did nothing to convert me. It was nice though. Fifth course was a tiny bit of beef fillet with a celery puree , a sweet potato chip ( like a crisp) and a soya sauce gravy. The meat was so tender it didn’t need to be any bigger. I could have done with a bowl of sweet potato crisps/chips they were great. 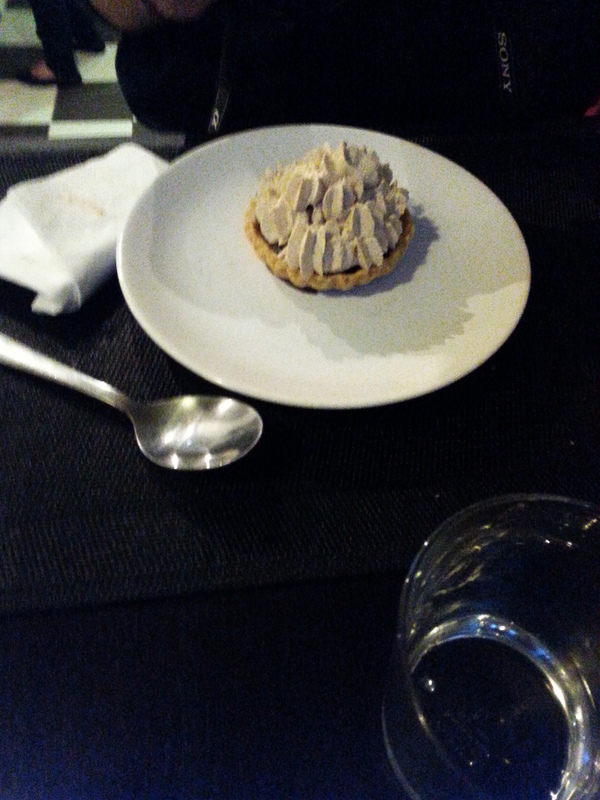 Dessert was a hazelnut panna cotta on a plate with an almond cake topped with white and milk chocolate, a dollop of vanilla ice-cream and a gooseberry. Gooseberries are so yum. I didn’t write down any of the wines but they were all very palatable. The red was divine. I went early so it was not too busy. I would like to go back. If you are staying in the area I think it is well worth a visit. On Tuesday afternoon I went on a tour led by Meg from the parisbymouth blog. It was a taste bud party! 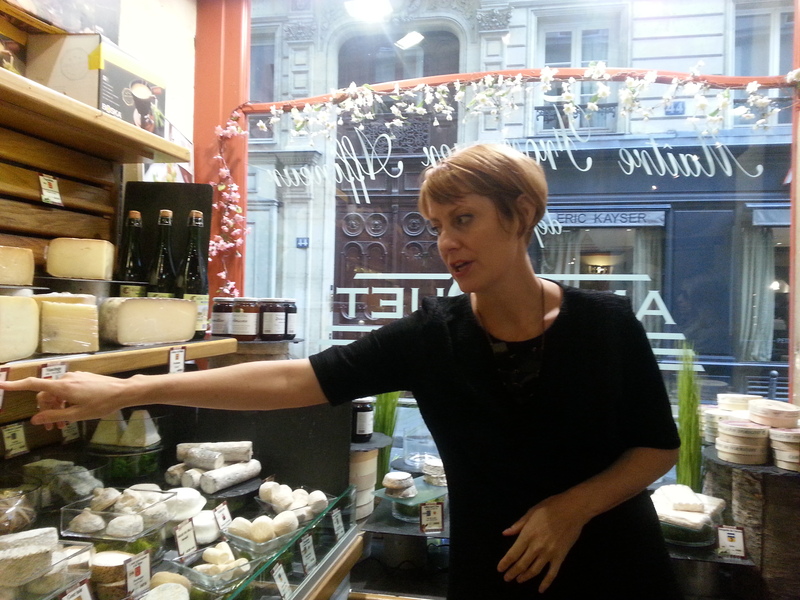 We went to two stores one was named Androuet they buy cheese from farms around France and age them in their shop. 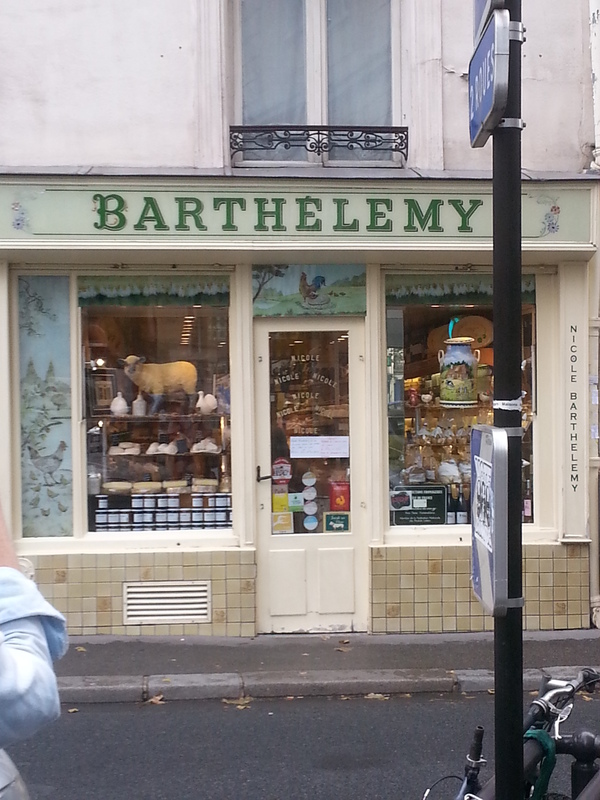 We bought ten cheeses from this store one of them was some brie de meaux made on a 7th generation family run farm where the women make the cheese and the men tend to the animals. It was one of the nicest cheese I have ever tasted. We also had some cheese with a sliver of black truffle in the middle that was delicious . I discovered I am quite partial to cheese made from “Rove” goats. The cheese made from the milk from these goats was very lemony and yummdiddlio. I will be hunting out some more before I leave Paris. I will definitely try my best to get back there. We then went for a bit more of a walk to a cave named Le Derniere Goutte and went and sat n their back room and prepared ourselves to try all the cheeses we had bought with some matched wines from the wine store.There was a young man from New Zealand from the store explaining the wines to us. I should have written down the names of the wines but Meg is kindly emailing us with all the details of the wines and the cheeses. It was a really fun tour. Meg was very friendly and welcoming she lacked the arrogance that the champagne tour guide had. Meg’s blog is very successful it gets half a million hits per month. It is a wealth of information on things to do in Paris. I have been avidly reading it and it was very nice to meet her. Saint-Nicolas (goat, Languedoc, 2-3 weeks) – produced by monks who live off the land, this fresh cheese expresses flavors of the thyme, rosemary and lavender that the goats are grazing on outside the monastery. Mont Ventoux (goat, Provence, 2-3 weeks) – this young fresh cheese has been formed into a cone with its base dipped in ash to resemble the mountain in northern Provence. Pavé de la Ginestarie (goat, Midi-Pyrénées, one month) – a square shaped and very runny goat cheese with a nice hit of salt. Rovethym (goat, Provence, 3 weeks) – a pretty little goat’s cheese from Provence flavored with thyme and decorated with a branch of the herb. Brie de Meaux AOC (cow, Ile-de-France, 6-8 weeks) – can taste of mushrooms, earth, wet leaves, mushrooms sauteed in butter, mushroom soup made with beef stock, or oysters. Some longer-aged versions have a strong ammonia smell which a few connoisseurs like. Hand-ladled usuing a perforated ladle (dates back to 12th century) that allows the curds to be transported to the mold unbroken in order to achieve the smooth, voluptuous custard-like interior. Brie de Melun AOC (cow, Ile-de-France, 7-8 weeks) – the coagulation of curds is slower (over 18 hours) than with Brie de Meaux because this cheese relies less on rennet and more on lactic fermentation. Flavor can vary wildly by the season, but it is usually more salty, meaty, savory and sometimes metallic and bitter when compared to Brie de Meaux. Brillat-Savarin (cow, Normandy/Burgundy, aged 2-4 weeks): this triple cheese is named after the food writer Anselme Brillat-Savarin – the version we had was stuffed with truffles. Ossau-Iraty (sheep, Basque Pyrénées, usually 8-17 months but our version from Barthelemy was aged extra long to 24 months) – this crowd-pleaser is nutty and salty, becoming more compact and concentrated with age. A version produced by the Agour cooperative was awarded the title “meilleur fromage du monde” last year in the World Cheese Awards against 2700 competing cheeses. Napoléon (sheep, Basque Pyrénées, usually 10-14 months) – a cheese with a tender texture and nutty flavor. Comté AOC (cow, Jura, usually 6-36 months – we tasted 18 and 24 months) – has a firm and supple texture that melts in the mouth and leaves a sweet taste (95% of cows used for this cheese are Monbeliarde, known for their sweet milk; the rest are Simmental). 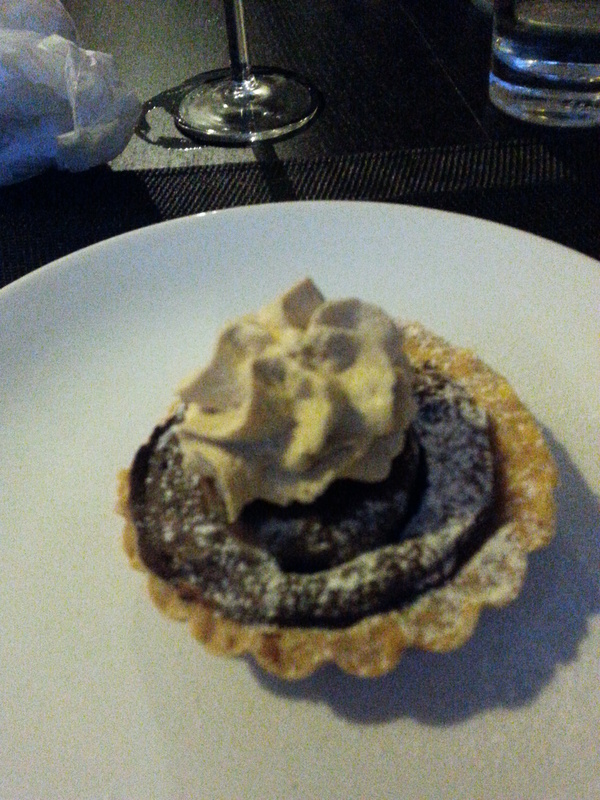 Can taste of melted butter, milk chocolate, hazelnuts, toast, leather, pepper, butterscotch, sweet orange. Strong salt but balanced with a nutty tang. This cheese has the highest production figures of all French cheese. Graded on a scale of 1-20. Those that score 15-20 wear a green band, those from 12-15 wear a red band. Below three can’t be labeled Comte. Aged for a minimum of 3 months but can be aged up to five years, although 18, 24, 30 and 36 are more common. Epoisses AOC (cow, Burgundy, 4-6 weeks) – this recipe was based on Maroilles, the first washed rind cheese created around 960 AD. Monks were forbidden meat on fast days, and with more than 100 of these per year, not to mention compulsory fish on Fridays, cheese was an essential part of their diet. Washed with Marc de Bourgogne, a brandy made from pressed grapes (like Grappa), the rind has a terracotta color and is sticky. The aroma is reminiscent of smelly socks and the taste is meaty, eggy, salty and rich with a long finish. Fourme d’Ambert AOC (cow, Auvergne, 2-3 months) aka Fourme de Montbrison – one of the mildest of all blue cheeses with a rich and creamy texture. Dates back to the 8th century. So my first weekend in Paris is drawing to an end. I spent most of Saturday doing as little as possible as I was a little over tired and my tummy wasn’t the happiest it has ever been. Then in the evening I met up with Lily from a blog called jetaimemeneither who took me on the most amazing walk around a few inner sections of Paris. Her knowledge of history is very impressive! I envy being able to remember so much detail of such amazing stories that made the world what it is today. Seeing buildings made in the 13th century is a little “mind blowing” when you are an untravelled citizen of a very young country. We walked and talked for what seemed like ( to me) half an hour but what was in fact two and a half hours and probably six and a half kilometres. She showed me so many buildings of great significance that I took photos of , I should have written down what they were. Lily told me wonderful stories about the people that lived in the buildings we were looking at that made the buildings come alive and took me back to the era momentarily. 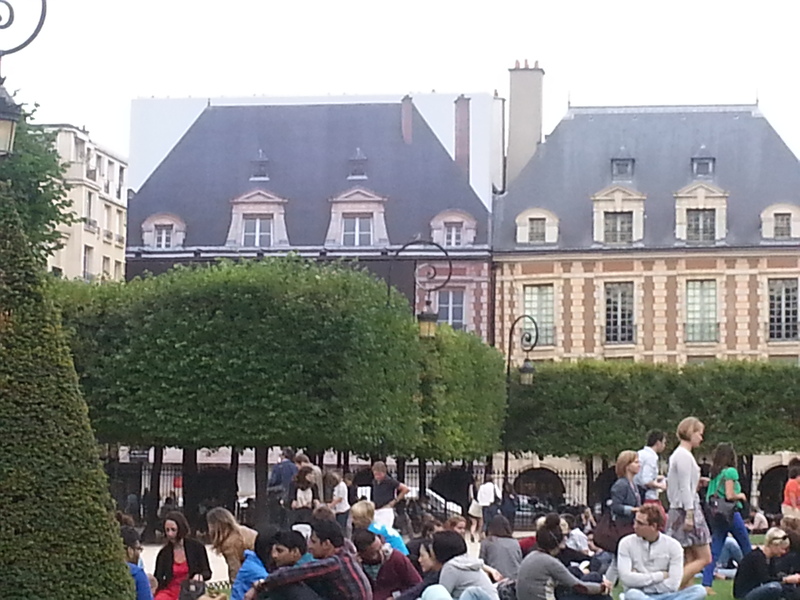 We went to the Place des Vosges were Lily told me a fascinating story about the man who my street was named after. He accidentally killed King Henry the second in a friendly jousting match in the Place des Vosges. His “Jousting stick” ( quick reference to the movie “the castle” 😉 ) accidentally struck the eye of King Henry the second and he died the next day from an infection from the injury. Note the house in the left corner has a facade of a photo of what it normally looks like while he real roof is restored. 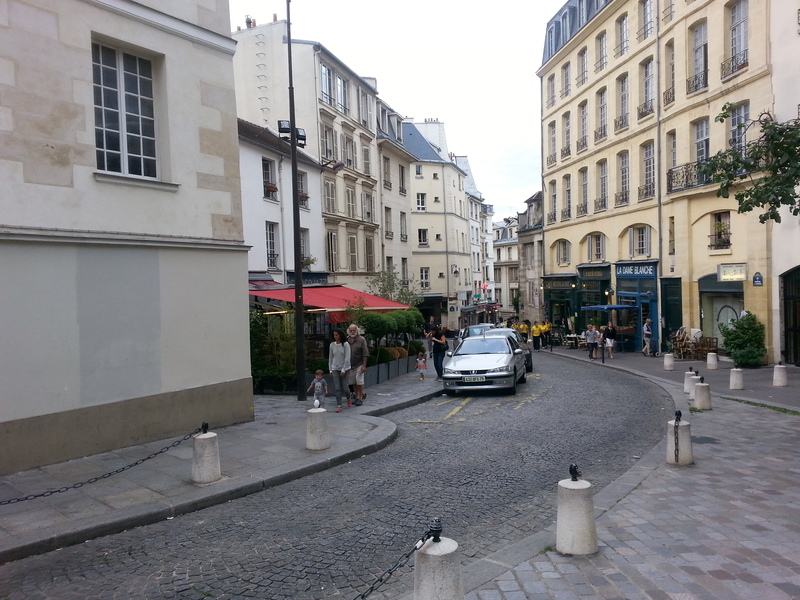 We went past the corner where Gil from “Midnight in Paris” picks up the car that takes him back to years gone by. We then went to a cafe and had a light dinner and a couple of drinks and people watched and chatted. We then walked back to the right side, I got to see the light show that the Eiffel tower does once an hour at night time. One more drink in a funky cafe near Hotel de Ville and then it was time to head home. It was so nice having a night out with a lovely soul that can speak the language and explain a few things. Then on Sunday I retraced our steps and went to a few of the museums that Lily had pointed out. I made sure I took a map as I knew I would be getting lost a few times a long the way. I went to the Musee de Carnavalet where they haphazardly display what life was like over the many centuries of Paris. The art and furniture were amazing ( i wish I had’ve got the audio guide). I loved how comfortable all the bedrooms looked. Then I went to the Maisons Victor Hugo, what a man! I wish he had just been elected our Prime Minister instead of the ——– that has been. HIs love letters were very dramatic though. I got the audio guide for that one and heard lovely and not so lovely stories about his family. I don’t mind spending the 5 Euro on an audio guide. I feel like I am giving some money towards the free museums and I learn snippets and it slows down the whole experience.. After a fairly ordinary lunch at Comptoir Turrene ( my spaghetti had a big clump that had been stuck to the bottom of the pot and burnt) I went off to the Musee Cognacq-Jay for more amazing pieces of art and most beautiful furniture with very intricate wood work. I had forgotten that the supermarkets shut in Paris on a Sunday so my search for a bottle shop was a bit futile. Just as well there is the bottles of champagne in the fridge!